Bestselling and Eisner-Award-winning writer Garth Ennis (Preacher, The Boys, War Story) and artist Carlos Ezquerra (Judge Dredd, Strontium Dog, Adventures in the Rifle Brigade) present an action-packed tale of future warfare and a heroine whose faith lies firmly in firepower in BLOODY MARY, coming from Image Comics this March. Ezquerra added: "Mary Malone is one of my best loved comic characters." BLOODY MARY is set in a world only slightly worse than our own, a third great European conflict has dragged the major powers into a lethal war of attrition. Now, Mary Malone, the most dangerous assassin in a land of killers, must face both a man who cannot die and a crazed cult leader whose flock are all too ready to die for him. 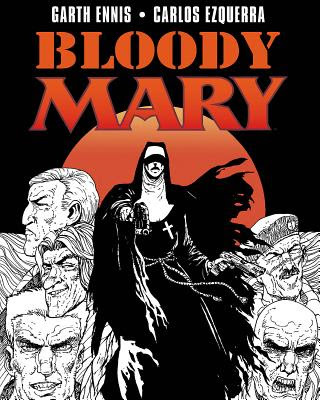 BLOODY MARY (ISBN: 978-1-63215-761-4) hits comic book stores on Wednesday, March 9th and bookstores on Tuesday, March 15th, and will be available for $16.99. It can be ordered by retailers from Diamond Book Distributors with Diamond code DEC150636. It can be preordered now on Amazon, Barnes & Noble, and Indiebound.